Carbon adsorption is highly efficient and achieves high levels of removal, especially with VOCs and odours. However with large flows it may prove uneconomical. A useful procedure is to combine the economy of wet scrubbing or stripping with a subsequent ‘polish’ with activated carbon. 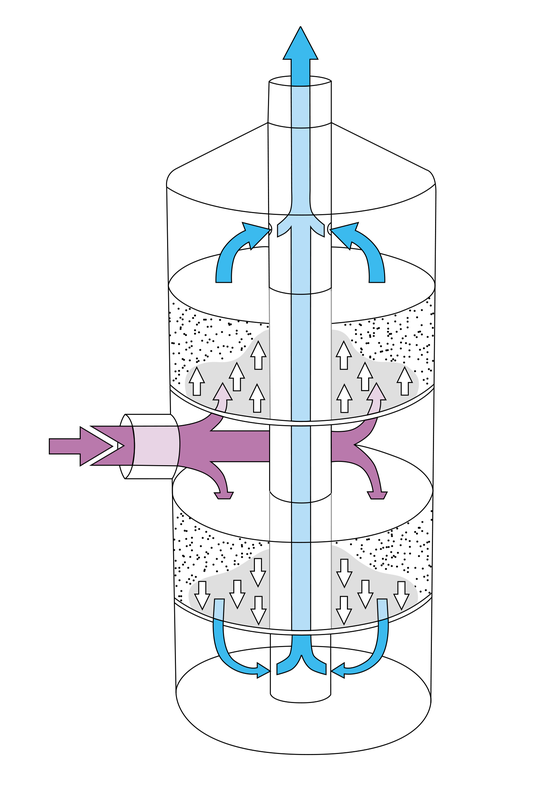 The packed tower will remove the bulk of the contaminant while the final fraction (plus stray components not scrubbed or stripped) can then be adsorbed without prematurely exhausting the rather costly carbon bed. 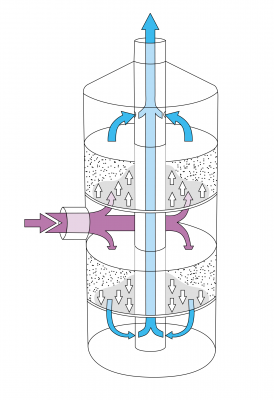 Operating conditions and humidity levels are critical for carbon adsorption but the technique will usually accommodate variable flows. An economical approach to larger or variable throughputs is to design an adsorption unit with two or more beds operating in parallel. Solvents, volatile organic compounds (VOCs) and other contaminants in the liquids or gas phase can be adsorbed onto activated carbon. The principle of adsorption is based on the highly porous structure of the granular carbon. Each gramme of activated carbon may typically have a total surface area, including all its internal pore structure, in excess of 1000m2. Contaminants are removed from the gas or liquid stream by the process of physical adsorption. Contaminant removal efficiencies are dependant on the nature of the contaminant, the carbon type, initial levels of contamination and gas flow rates. When a carbon bed is saturated with the contaminant the material would normally be removed and exchanged for new material and the exhausted carbon would either be disposed of or reactivated by the carbon supplier. In certain applications in-situ regeneration can be undertaken a number of times by flooding the carbon bed with a chemical reagent. The carbon will, however, eventually become ‘poisoned’ by contaminants and need replacement.